Mr Postman, wo wo wo Mr Postman! Yesterday was spent almost completely on an ongoing mission to get all my visa extension forms filled, money orders made, parcels sent, everything signed…. it was a Wednesday filled with beaurocratic nonsense, made much lighter and happier by the final send of of visa forms and the arrival of my bigger-then-expected box of goodies from Dharma Trading! 6 days to get from their California warehouse to the outskirts of Melbourne, Australia- Good work huh! So my evening was spent happily deconstructing things to use as recycled material, and pre-washing large quantities of fabric. As you know if you read this blog Im in the process of moving my handmade clothing line over to being as ethically concious and environmentally aware as I am able, with all my material being Fairtrade/Organic, or Recycled. And it’s all looking very possible and all my hours and hours of researching is starting to pay off! I’ve found a lovely interim supplier of affordable Indian grown and handwoven Organic cotton (plain for dying but also blockprinted naturally dyed material too) until I can source a company selling affordable Australian organic cotton, Ive found an amazing brand of dyes that are available in amazing vibrant colours and are completely fade resistant and baby friendly….and I’ve switched all my packaging over to being all recycled! So far so good! I attempted my first dye bath last night, just a small one to experiment with first off, using the ‘Kingfisher Blue’ Procion MX Fibre Reactive Dye. The whole process of Dyeing took around 2 hours + the time to pre wash material and clean up. I can see why people like to do larger batches! 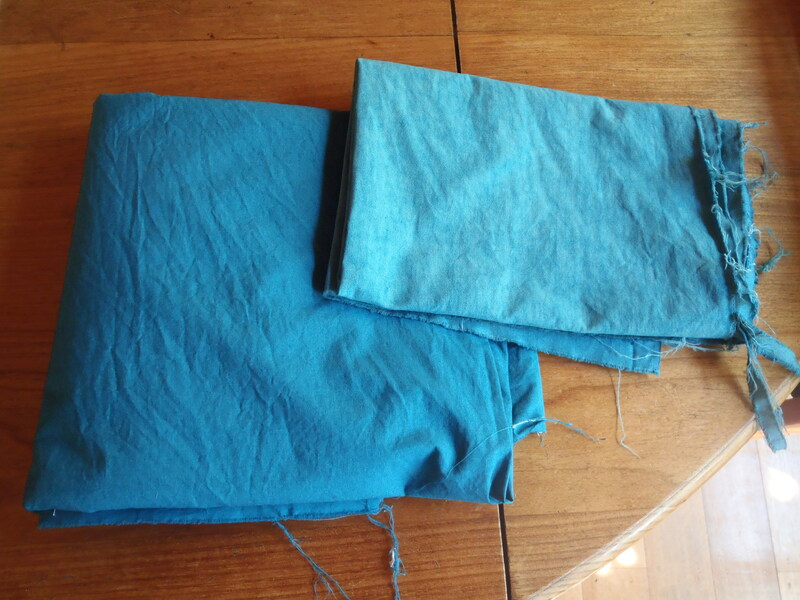 I dyed about 600 grams of material, a peice of thick cotton which was part of a recycled duvet cover I bought, and a small peice that was an opened out pillow case. 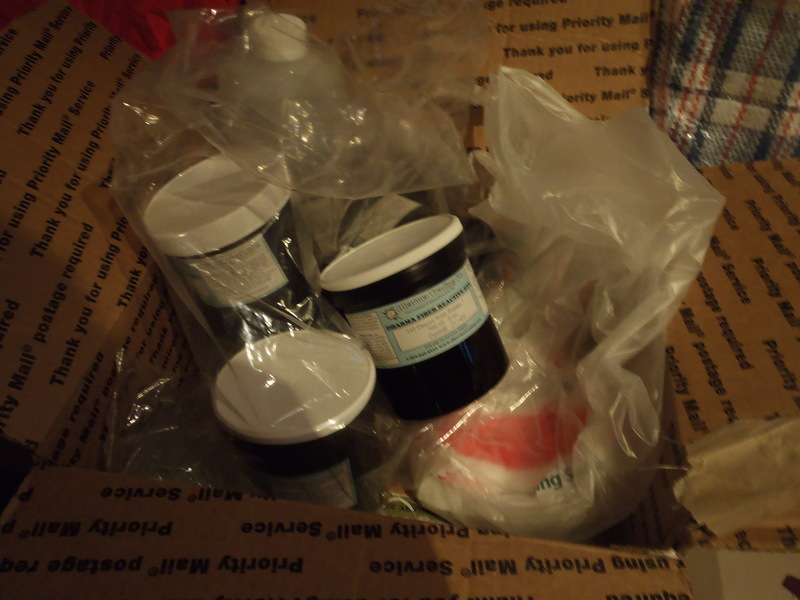 For all that material I used 25 grams of my dye (I bought 225 g dye pots for each colour), 2 cups of non iodized salt (it said I should use 3 cups for that amount but I didnt have enough) and 1/3 cup of Washing Soda(also known as Soda Ash). First I dissolved the dye powder in warm water and added it into the sink, then I added 3 gallons of warm water and added the salt, stirring until everything is dissolved and mixed well. Then I added the material and stirred every couple of mins for 20 minutes. After that I mixed the Washing Soda with a little hottish water until it was dissolved and in 3 intervals of 5 mins I added in the soda ash and stirred (15 mins total). Then for 50 mins I stirred the fabric in 10 min intervals. 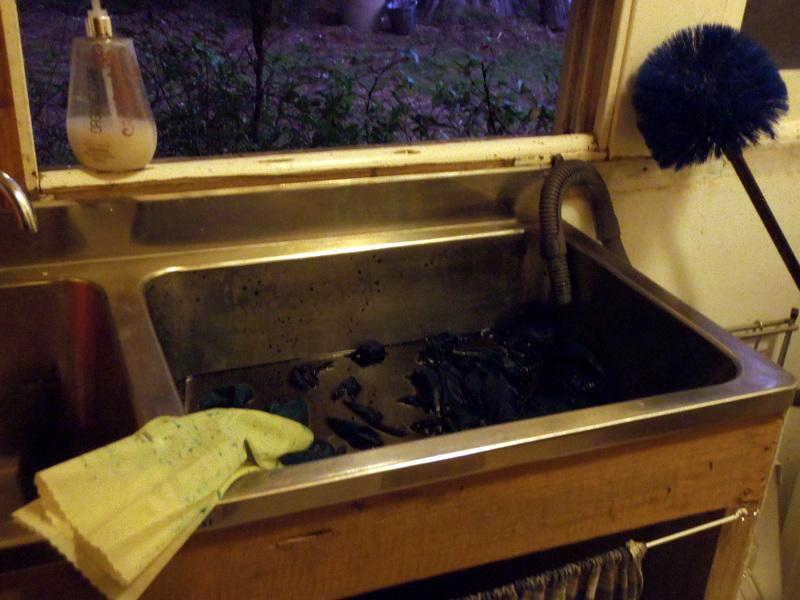 Because we are living with Tom’s parents here, and it is all organic and they have a septic tank, I ladled out all of the unused dye into a seperate bucket (after moving the fabric into the other sink) and then Tom and I chucked it over the boundary fence! Naughty, but next door is a disused school and they spray all their boundary with a multitude of pesticides so its all dead and chemically there anyway…. fingers crossed all the grass wont be blue when I look today! A mission to say the least but the dyes are still chemical based and its not an option to put them through the septic system as all the grey water gets put onto the reed section on the boundaries and it may contaminate the native borders. So here is my first finished dyebatch! The colours on each peice of fabric are REALLY great and not streaky, and its amazing just how vivid the colours are too! The smaller peice of material has actually come out a lighter shade, I think because I added it in as an after thought so the larger peice had another 5-10mins of dye time, but I actually really love it a lighter shade so I think I may add a little less dye powder next time to try and get the batch closer to the lighter shade. But im so happy with the results and I love that this fabric is now completely clean and ready to iron and use, as well as having been thoroughly washed as it is recycled and pre-shrunk! 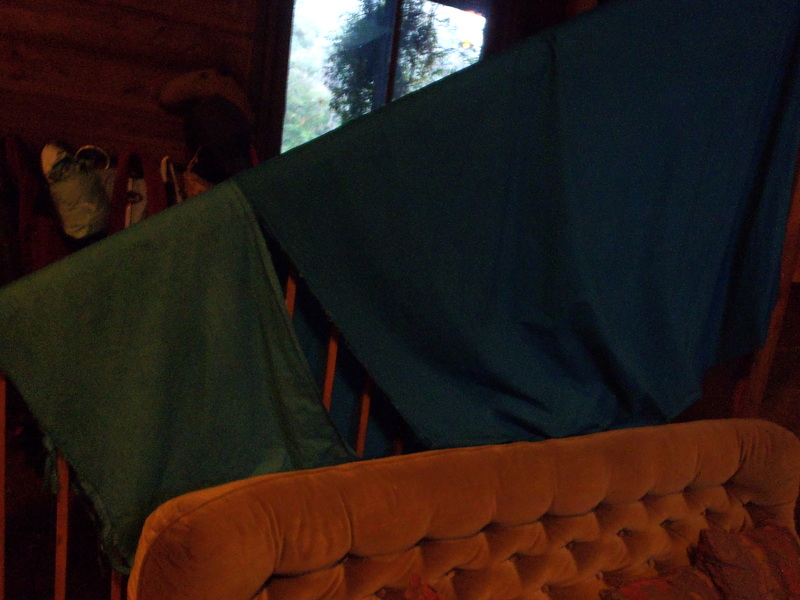 The first photo below was the fabric wet straight from the machine last night, and the second is the fabric all dry and folded this morning…. the shade lightenend a little once it was dried but not too much. yum! These dyes really are the bees knees 😉 Now I just wish that they could be COMPLETELY chemical free! Im planning on doing another small batch today (as I still dont have much Salt), I think this time with my Dusty Rose colour, with the intention of creating a large amount of dyed fabric stockpiled before I start using it. Tom wants me to get through all of my store bought material before I start sewing with this Eco-stuff, but I dont know if I can resist for that long! I only have a small amount of store bought material left, as I stopped buying it a good few months ago now, and I might use it all up on family christmas prezzies. Ill take photos of the process with the Dusty Rose colour too so you can see how the end result compares to the dye bath colour. So much FUN! I love fabric, lalala. SO I am still having my big 20% Clothing SALE on my online store http://www.etsy.com/shop/TheSelkieFolk and the sooner I sell my beautiful old stock, the sooner I can start adding new recycled and organic garments on too!